Arty and Eric? yea there two guys who have been doing radio together since 2007. Starting in 2011 they put together a St. Pats pub crawl through Boston. Although they skipped 2013, they don’t care, its still annual. 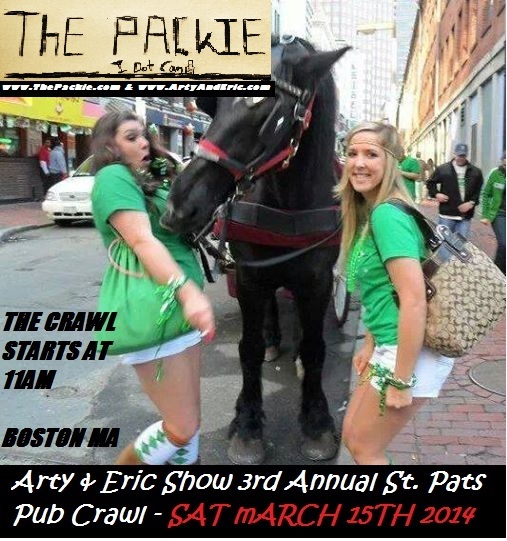 This Crawl is brought to you by The Packie – http://www.ThePackie.com – The crawl starts at 11 AM. Arty & Eric will be interviewing people on the street all day long and even at some point record an episode of the show. From this point on we’ll probably stay here, but you never know!